This section reviews a few basic linux commands. You can use the tutorial information presented on this page or for more in-depth coverage go to www.linux.org/forums/beginner-tutorials. For help running programs on the Stern GRID see GRID Processing at Stern. To log in see Connecting to SCRC Computers. To change your password go to SIMON. This tutorial presents the minimum Linux command set one would need to use and run programs on the SCRC Linux computers. The Linux machines use a command line interface called a shell. The shell is the interface where you enter Linux commands. There are many types of shells. By default, SCRC Linux machines use the BASH shell. Once logged in, you are deposited into your home directory. Every user has a home directory. This is the current directory path. Here, Linus’s home directory name is “torvalds” which is contained within a directory called “it” which is inside the directory “homedir”. The Linux directory structure is a hierarchical tree structure. ls is the command and -l is, in this example, the option for the command. The -l option formats the results into long format. Long format lists more than just the names of the files which is what ls alone would show. In this example, the output shows 3 directories – “angel2”, “angel3”, and “angle” (notice the d at the beginning of the line), and 2 files – “prog.sas7bdat” and “prog.sas7bdat.log”. Some other information we see, e.g., the size of the log file is 1421 bytes, it’s owner is torvalds, it’s last modification date is Nov 18 2009. This command creates a new directory called “costProject” inside the current directory. Verify this by typing ls -l.
Note: Linux is case sensitive, so for example “costproject” is not the same as “costProject”. Verify that we are in the “costProject” directory using pwd. 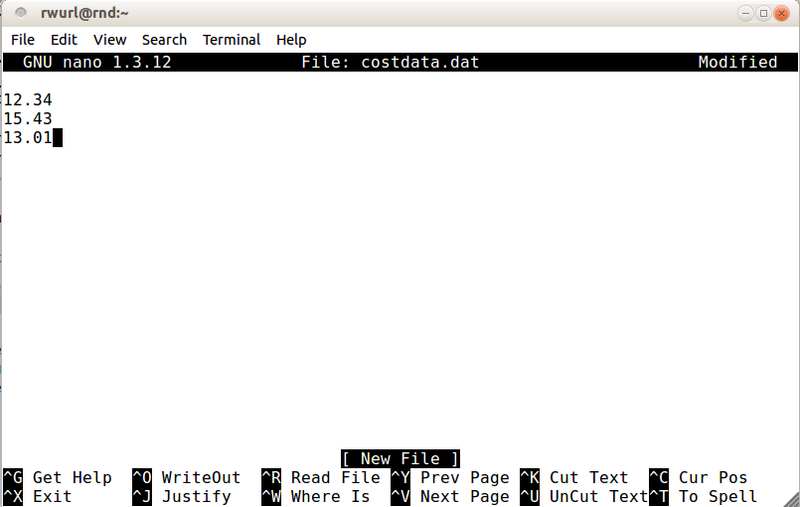 Figure 1 shows the nano editor editing the file “costdata.dat”. Along the bottom of the nano editor are the editor’s commands. The character ^ is the ctrl key. To save the file you type ctrl-o and then to exit nano type ctrl-x. If the file contents are larger than can be shown in one page, the more command shows you the first page and halts. To see the next page press the space bar and to quit type q. If you get stuck or “hung” after typing a command, etc., then use ctrl-c to break out or cancel your current command. ctrl-c returns you to the command prompt. Most Linux commands are short, typically an abbreviation or mnemonic for what the command does. For example, the command to delete a file is rm which is short for remove. Recall: Linux is case-sensitive, i.e., it distinguishes between lowercase and uppercase (recognizing commands in lowercase only). Here are some examples of basic Linux commands and command syntax. Note: There is no undo in Linux therefore once a file has been deleted there is no easy way to recover it. The more command displays the contents of a file, one screen-full at a time. Press the space bar to move forward screen by screen until the end of the file is reached or press the letter q, for quit. The asterisk (*) is a wildcard character that matches one or more characters. will place the output of the ls command in a file named “list”. If a file named “list” existed before you entered this command, any previous contents will be written over. The output of the date command would be added to the bottom of the file list. The output of one command can be fed as input into to another command. The symbol for the input/output (I/O) connection is a vertical bar | called a pipe. For example, a directory containing many files will scroll off the screen if just ls is entered. If a pipe is used to direct the output of ls to be the input of more, then the directory listing will be shown a screenfull at a time and will not scroll off the screen. will display a one-line synopsis of all manual pages having to do with directories. Linux uses a hierarchical file structure, which is made up of files, directories and subdirectories. A file can hold text, data, or a program. Directories contain files and sometimes subdirectories. A subdirectory is a directory that has been created within another directory. Since Linux is set up to let users share files, you have the option of allowing or denying access to others on the system. Permissions determine who may access your files and directories or what may be done with a file or a directory. Use ls -l to see what permissions your files and directories have. The characters “d”, “r”, “w”, “x”, and “-” at the far left indicate the permission of each file and directory. There are 10 positions. Position 1 is the directory indicator. Positions 2,3,4 apply to the owner (creator) in this case torvalds. Positions 5,6,7 apply to the group. Here, there are two different groups shown, “devel” and “resch”. Positions 8,9,10 apply to all users. If the first letter is a “d”, the file is a directory. If the first character is a hyphen (“-“), then it is a regular file. A file must be readable to be looked at or copied. A directory must be readable for you to list its contents. A file must be writable in order for you to modify it, remove it, or rename it. A directory must be writable in order for you to add or delete files in it. A file with executable permissions is one you can run, such as a program or a shell script. A directory must be executable in order for you to move into it (using the cd command), list its contents, or create or delete files there. The hyphen (–) appears when the permission is switched off. For instance, if a hyphen (“-“) appears in place of an “r”, then the file or directory is not readable. The file is read/write for owner, read only for others. The file is read/write/execute for owner only. The directory is read/write/search for owner, read/search for group, searchable only for others. Press the tab key after enough of the word you are trying to complete has been typed in. If when hitting tab the word is not completed there are probably multiple possibilities for the completion. Press tab again and it will list the possibilities.